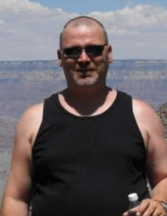 Steven K. Rhodus, 51, passed away on Thursday, November 29, 2018 at Community Howard Regional Hospital in Kokomo. He was born in Anderson, Indiana to Stanley (Butch) and Joan (Adams) Rhodus. He was a 1985 graduate of Pendleton Heights High School and then entered into the United States Air Force, where he served until his discharge in 1991. He has also been a devoted employee of Auto Zone for the past 22 years. Steven is survived by his wife of 32 years, Mary Rhodus, Bunker Hill; one daughter, Danielle Rhodus, Bunker Hill; one grandson, Jacob Bagwell, Bunker Hill; one sister, Sheila (Randy) Haney, Tennessee; one brother, Travis Rhodus, Muncie; multiple aunts, uncles, cousins and several nieces and nephews. Steven was preceded by death by his maternal and paternal grandparents.